Only the 50Hz models at the moment. Have fun with this project, but I can't emphasize it often enough: please be careful with high voltages. 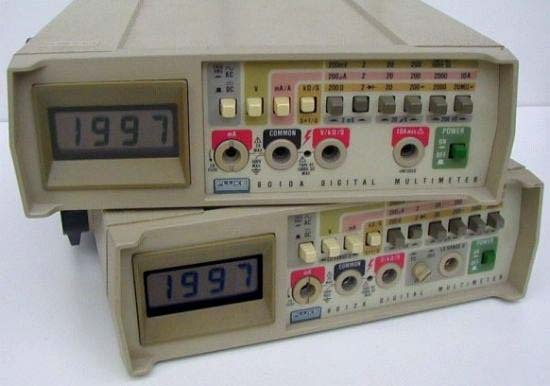 For many years I felt the desire to connect my ancient Fluke meter models 8010 and 8012 to the computer. At long last I succeeded in developing an interface to the SB-Bus. In the past I often thought about the ideal interface system for these Fluke meters. Some ideas could never be realized though, and I stripped down the wish list to those things that could easily be implemented. It took me exactly one month to build and program the current version of the interface, and I must say that I'm quite satisfied with the end result. I started the job at 25 April 1997 and the 2nd meter was finally closed at 24 May of the same year. All together it took me 57 hours to finish this project and I had to start the assembler 384 times to complete the software. The basic plan was to be able to read the display on command. I decided to read only the value, and forget about the actual range and function. Reading the range and function would require too severe modifications because there are not enough free switch contacts available to read all possible switch positions. Such a program is relatively simple to implement, but during programming new ideas surfaced and the basic plan was somewhat extended. I wanted to implement a log function that could store as many values as possible in the available memory. Such a log function could come in handy if you want to measure the discharge characteristics of a battery for instance. If the meter can log the values by itself, it won't be necessary to keep a log program running on a host computer all the time. At first the meter could store 600 readings in the available memory, but with some compression it is now possible to store up to 701 readings. On the other hand it would also be nice to be able to make it remember the maximum, minimum and average measured values, so that function was added too. I also wanted to use the BT indicator of the meter's display to indicate that the log function was active. This was not possible anymore because all I/O lines were used up. I could free some I/O lines by implementing an I²C EEPROM memory to store the SB-Bus address instead of using a set of jumpers. All together the wish list was growing again, but all new items to the list could be realized. Like I said, I'm very satisfied with the end result, if I may say so myself. Both meters can now be connected to the SB-Bus, and can store measurements in their log file autonomously. The results in the log file can be read at any convenient time by giving a simple command to the meter.